Trivia – what do Chris and I like to do when they get a weekend off? Correct answer is – go on a hike, of course! And right you are! 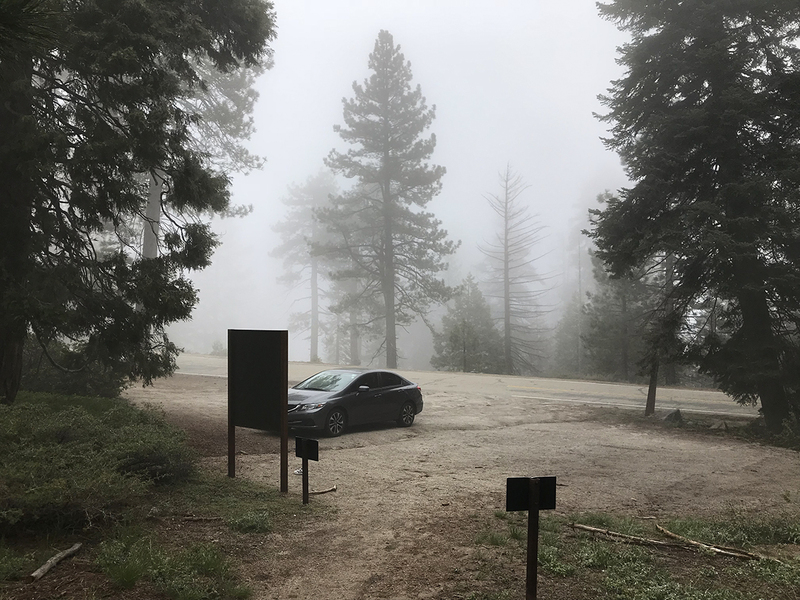 On the last weekend of May, we drove up to the mountains and did the Buena Vista Trail to the Buena Vista Peak at Kings Canyon National Park. The hike itself was rated easy, and was only 2 mile in length (out and back). The views at the end were beyond amazing and the fact that we went on a cool and foggy day made everything so much better. We had planned to leave at six in the morning but I overslept and turned off the alarm, we ended up leaving home at 7:30AM. A little bit of a late start, but the weather forecast was in the 30s that day, so it wasn’t too bad. 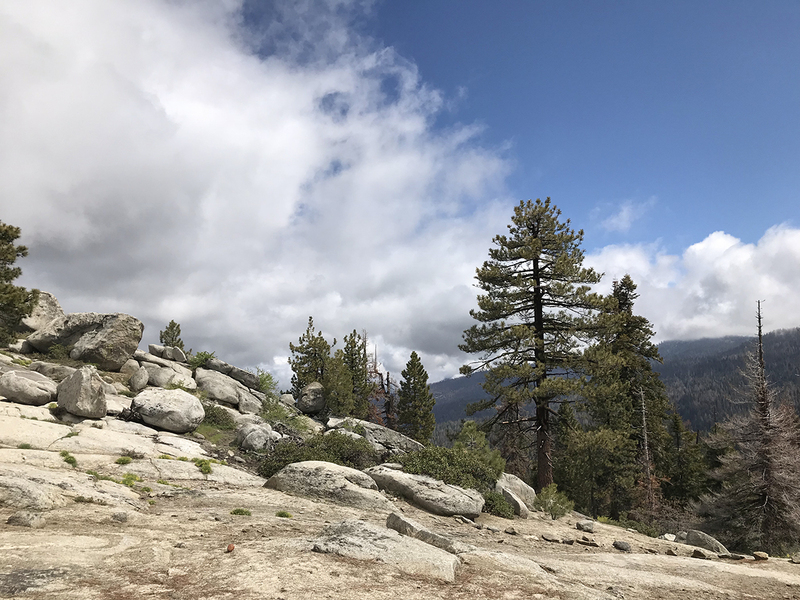 The roads to Kings Canyon was the through the backcountry so we didn’t encounter too much traffic. The trailhead was literally on the side of the road with a little parking spot, so it made life so much easier since we found it right away! We were the only ones at the trail so it felt like we had the trail all to ourselves – and that’s always such a great feeling. 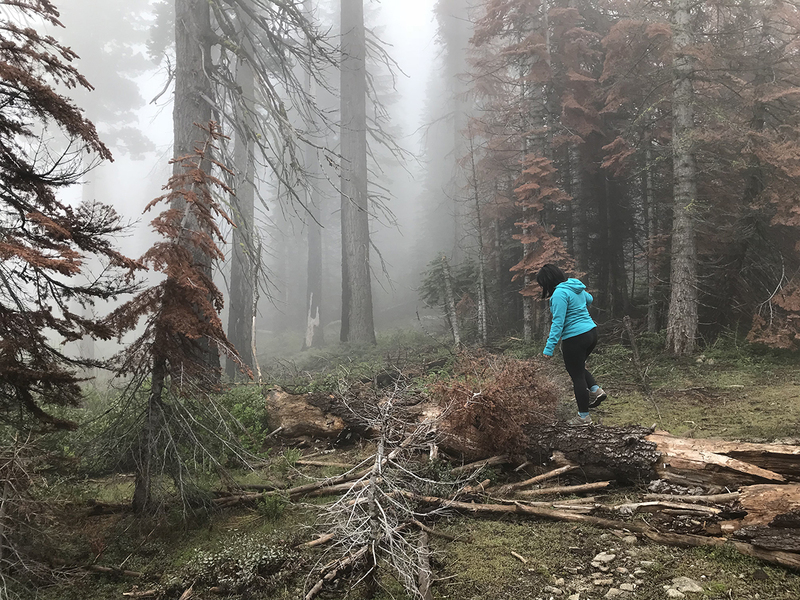 The fog was consistently dropping throughout our hike and it was amazing. That being said, we kept cool and were shaded the entire time. 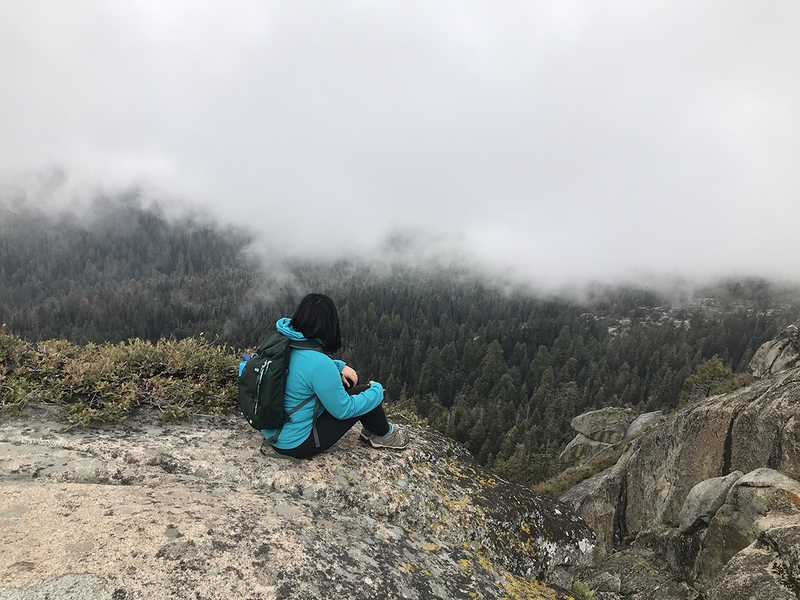 We made it to the top in 40 minutes – could’ve done it in less time but we were in so much awe of the fog and the view that we kept stopping to take more photos. The fog lifted for a few minutes when we got to the top but came right back down. 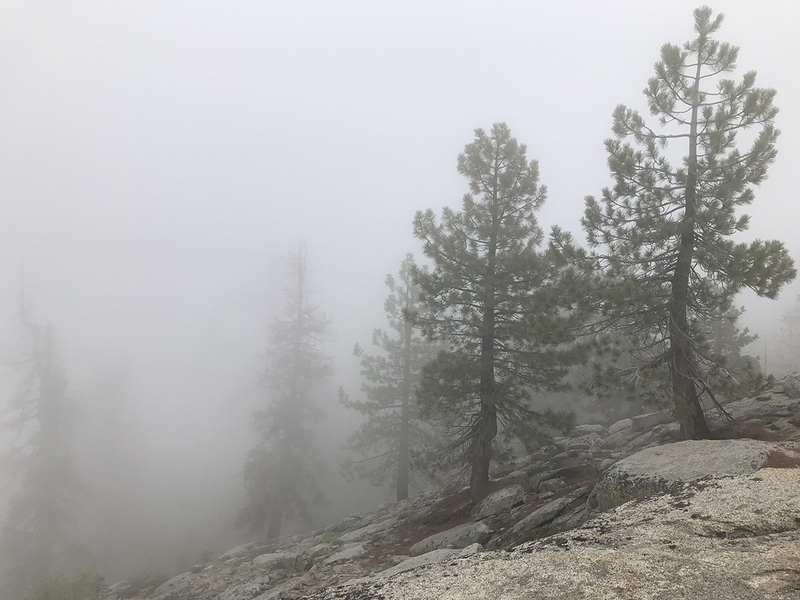 The panoramic views we got of the entire park and the summits of Sierra Crest, even with the fog, was beyond amazing. 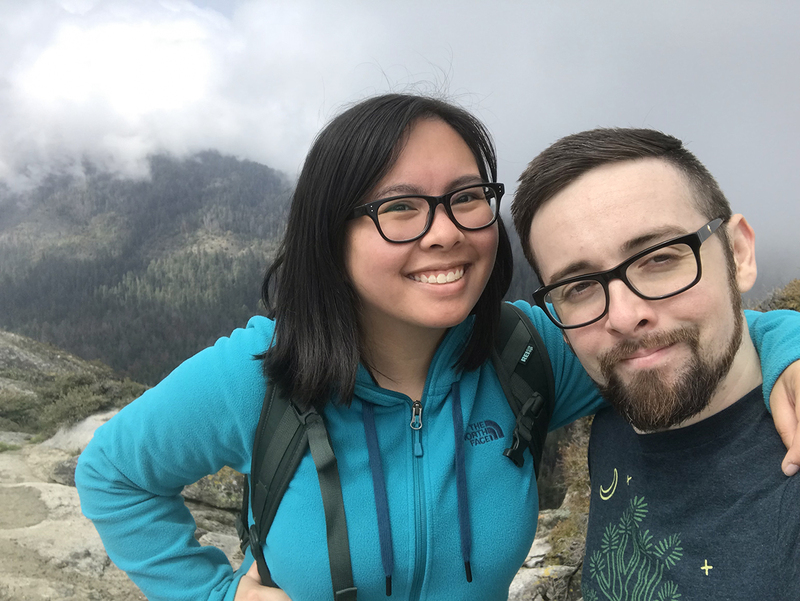 A little bit nerve-wrecking when climbing on the rocks (I mean, if either of us slipped and fell, we wouldn’t even know what we’d be falling into) but still a great view! How amazing are these views?! Easily one of my favorite hikes of the year. Can’t wait until the weather cools down so we can visit this view again. We left the park right after and stopped for lunch at a&w then called it a day. 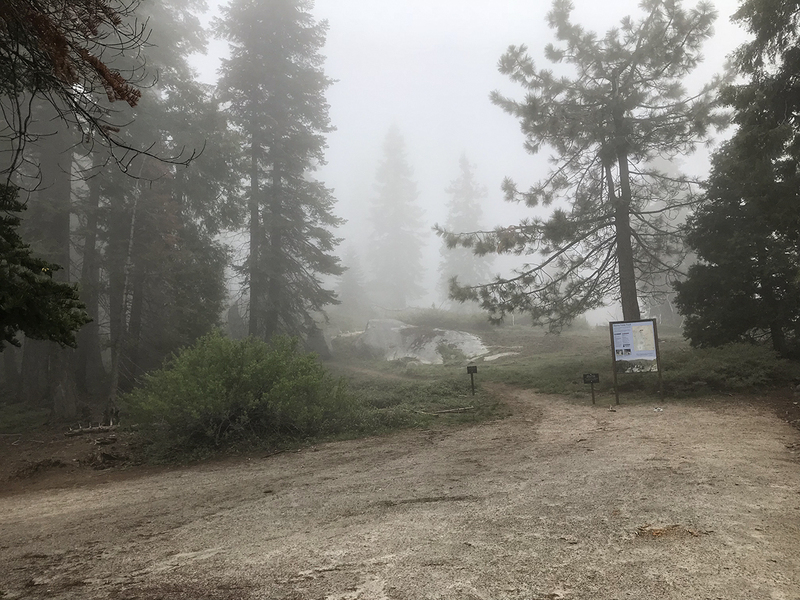 To the trailhead: Enter Kings Canyon National Park via Big Stump Entrance Station, off the 180 East. Proceed 1.7 miles to a three-way intersection. and turn right on Route 198, which heads south toward Sequoia National Park. 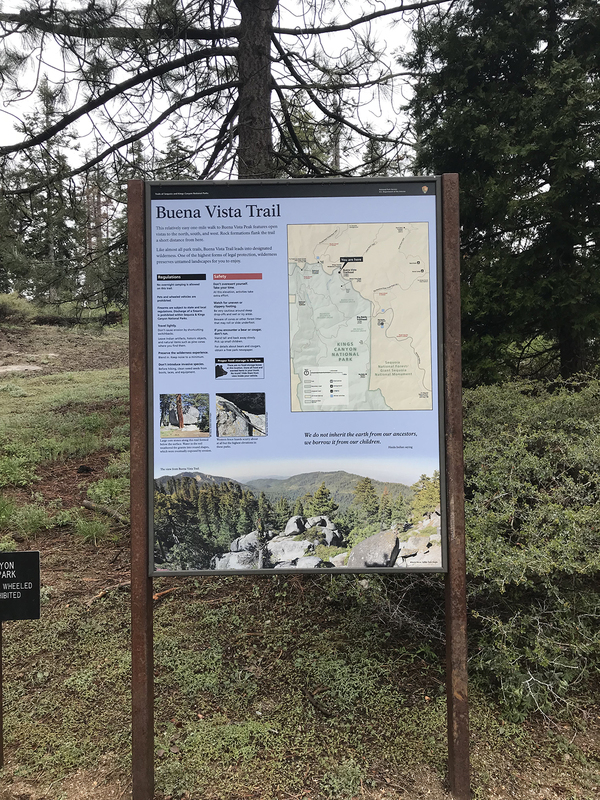 The Buena Vista Trailhead will be on the right after 4.7 miles. Those pictures are amazing!! I definitely need to hike more.. I love that you’re in reach of all sorts of trails!! 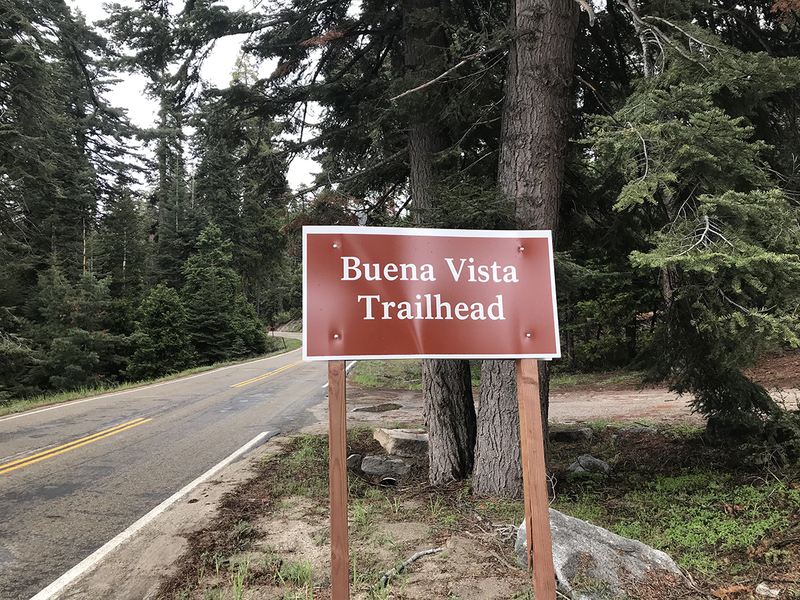 I like the sound of the Buena Vista Trail. 2 miles, sounds like a great adventure. You went during a good time too – away from the heat and all. I like that your car was the only one there XD. YOU TWO ARE ADORABLE!! I am glad you had a great time out there and didn’t get injured! Though, I am sure you’re a trooper either way ;)! The pictures and description of the fog are just mesmerizing. I would LOVE that hike. It just seems so peaceful and ethereal with the fog. Thank you for taking us along! The pictures of the fog are mesmerizing. I would LOVE this hike. Something about the fog and nature feels so ethereal to me. Thank you for taking me along! I love going on a hike when on a road trip, and your photos make me want to drive to Buena Vista Trail asap! The photography in this post is absolutely insane. This place is absolutely beautiful but all of that fog is kind of creepy as well! Hiking is probably one of my favourite forms of exercise because you’re enjoying the outdoors and can take it at your own place, I just wish I lived closer to some trails! I’m in love! This is so gorgeous, and I love that mist…so amazing! Wow these snaps are something straight out of a movie! What an adventure! Looks bloody brilliant! I’ve never done a hike but OMG these views are amazing! Now very tempted, and your photography is beautiful! That looks like a foggy place to visit. It actually reminds me of some scary movies that I have watched before. This trip is perfect for couples. 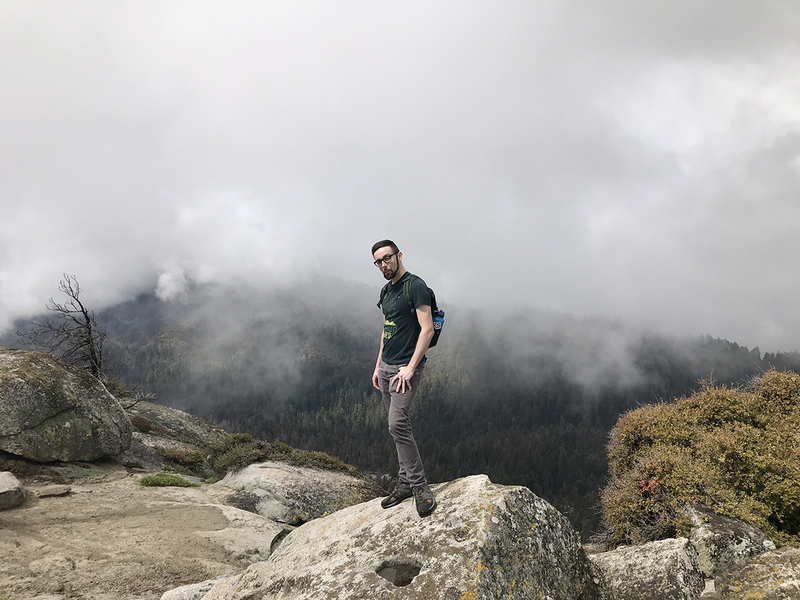 Cool and foggy days are the best to hike in! Gorgeous photos. Wow, this looks gorgeous! I love places with lots of trees so this is beautiful. 🙂 Hikes are the best! So tranquil, so scenic. Breathtakingly beautiful. I am tempted to travel right now. Your pictures look amazing, the fog looks really eerie almost like a movie. I have never been hiking myself but it looks like you had an amazing time plus the view looks stunning. These views are incredible! I’ve never actually been hiking before but it sounds like it would be so fun! Thank you so much for sharing! Wow! Your photos are incredible, as always! The fog makes everything look so cool and mysterious! You’ve definitely inspired me to go hiking sometime soon! Loving the photos, they are so beautiful! I have never been to the Buena Vista peak but oh wah, the views from up there, gorgeous! Must have been such an amazing magical hike! Wow these photos look amazing and it sounds like you both had a great day out! I really need to get into hiking. Looks refreshing and is good for my dog and me. Love the scenery in your post, Great photos! What a cool hike! I would love to visit this National Park. I was close because we went to Sequoia National Park. Couldn’t fit it all in. that fog looks so cool! what a great place to explore! Ahhhh the fog is so majestic! I love the picture of Chris walking down the road. I feel like it’s been WAY too long since I’ve been on a hike. You guys always go on the best ones! Also, I’m definitely the one who hits the snooze and makes us late… Whoops! The view from the top with numerous pine trees at the bottom is exhilarating and worth all the effort. You are so dedicated when it comes to hiking! I have a like-hate relationship with them. It’s wonderful to do a hike though when it’s cool and foggy outside. Probably makes it more pleasant and the air is far better. 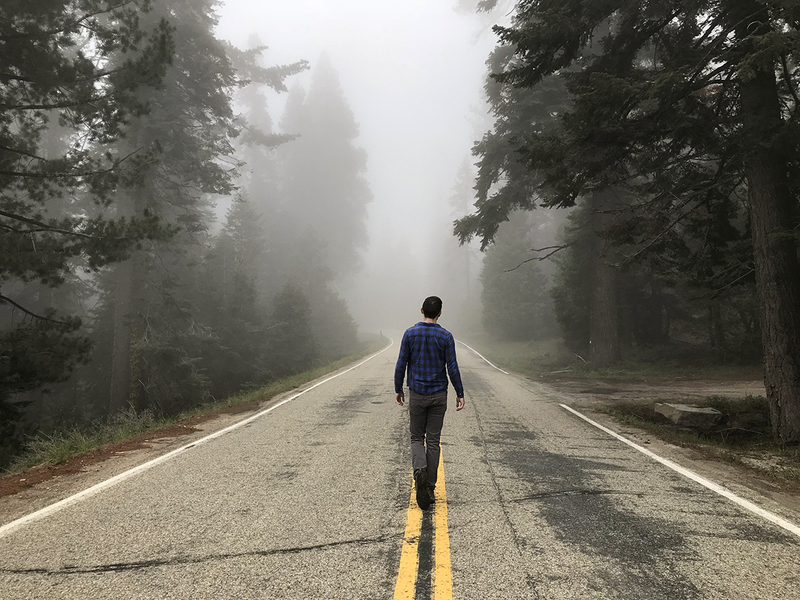 Love the photo of Chris walking in the middle of road. 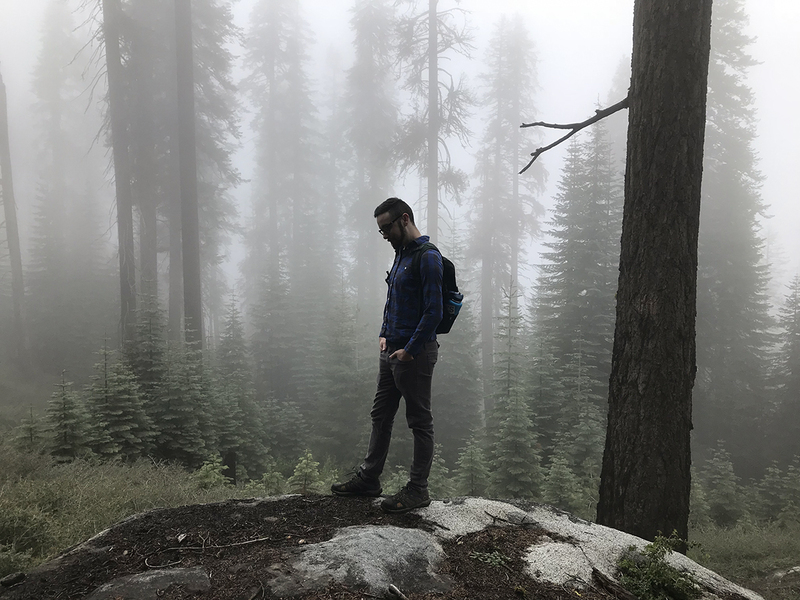 Wow, you took some AMAZING photos there <3 Would love to go for a hike too!